Atletico Madrid coach Diego Simeone says his team’s painful derby defeat by Real Madrid on Saturday was not down to VAR. The video assistant refereeing system was used on multiple occasions during a stormy clash at the Wanda Metropolitano, including to award Real Madrid a penalty and disallow an Alvaro Morata lob. 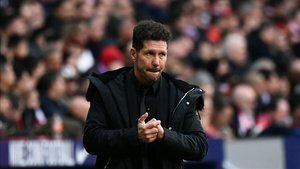 Casemiro, Sergio Ramos and Gareth Bale’s goals saw Atletico beaten at home for the first time all season, with Simeone conscious his team need to improve. “VAR is something that will grow and improve and it will make everything more efficient,”r; Simeone told reporters. “I hope and I wish that the decisions were correct. I don’t at all believe that we lost because of VAR.